In a call for Boston city officials to achieve greater recognition of women in commemorative monuments and memorials, the Boston Women’s Heritage Trail suggested the city of Boston undertake an audit of existing commemorations as in public art, names of schools, playgrounds, streets, and the like. In searching for information to support this audit, we discovered a valuable resource — Deborah Lee’s blog documenting women in Boston’s Public Art. Have you ever heard the names of Anne Whitney, Theo Alice Ruggles Kitson, Meredith Bergmann, Lilli Ann Killen Rosenberg or Emma Stebbins? Probably not. However, the chances are high that you have seen and walked by at least one of their creations. Each of these women is responsible for some of Boston’s Public Art. BWHT would like to suggest that you visit the blog written by Deborah Lee. After reading Lee’s engaging blog about the women and their art, you will look at Boston’s public art in a new way. 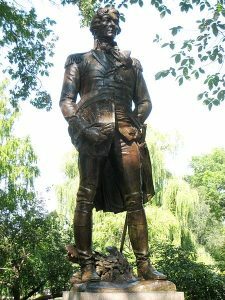 Do you know which of the artists mentioned above is responsible for this Thaddeus Kosciuszko sculpture in the Boston Public Garden?